In last week’s opening post in his series about game-based learning, David Dodgson looked at some of the myths that surround both GBL and gaming in general. 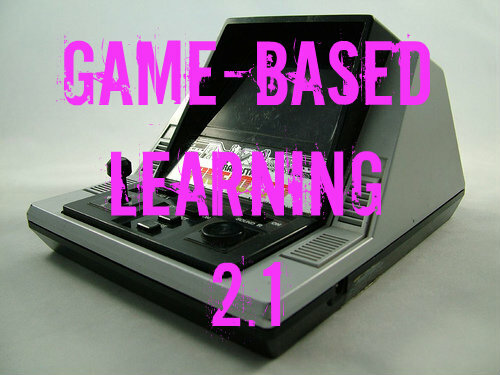 This week, he discusses some of the benefits and pitfalls of introducing gaming to the language learning classroom and also examines when and how a teacher might take such an approach. Gaming can at times be a controversial topic (as shown by some of the myths/misunderstandings discussed last week) and the same is true for game-based learning. Taking something that is very much associated with leisure time and entertainment and applying it to an environment where the ‘serious’ business of learning is supposed to take place certainly raises a few eyebrows and it is often necessary to justify the use of GBL to stakeholders such as administrators, parents and perhaps even the students themselves! For the first part of this post, I will present some questions and doubts that I often hear about GBL along with my responses to look at how to introduce the concept of GBL to an EFL class for the first time. What they say: So, the students just play games? Don’t they do that enough at home already? Where’s the learning? What I say: GBL is not merely about playing games. It is a way to get students interested, engaged and using the language they are learning. Simply put, using a game in class is a lot like using any other media – it can be highly effective as long as it is part of a structured lesson and there is a clear purpose for doing it. When we use a video clip, for example, we do not just play the video. We integrate it into the lesson by choosing a clip relevant to a current classroom topic and/or suitable for our students’ language level. We also design some activities to do before, while and after watching. It is the same when we use a game – it should be relevant, suitable for the level and age group and a lesson should be built around it. That way we can ensure our students are not merely ‘playing’ just as they are not merely ‘watching’ when we watch a video. And, yes, many students do play games a lot in their spare time but they do so for fun with no learning goals in mind. By providing structure, we can take something from beyond the traditional classroom environment and use it to motivate and engage our leaners. In my experience, gaming is a topic students (especially the younger ones) are keen to talk about and that is something that should not be ignored. What they say: OK, but video clips, especially from YouTube, are often short. Playing through a game can take a long time. How can you justify such a time investment? What I say: It all depends on the game in question and how it is used. Epic online adventures like World of Warcraft or open-ended games like The Sims demand a lot of time in order to progress and they often require time to learn how to play the game, all of which can eat into our lesson time. However, there are also shorter, more casual games that do not place such time demands on the player, especially with the recent growth of smartphone and tablet gaming. An app such as Can You Escape?, a puzzle in which you must use items and clues around you to figure out how to unlock the door and escape the room, is ideal for use in the classroom. It has short levels with clear goals and the control system is straightforward. It’s also great for the language classroom as it covers house and home vocabulary, prepositions of place and commands. You could even extend its use to bring in offering advice. There are many other such casual ‘pick up and play’ games that can be used in similar ways. For the PC, demos also offer a way to use games without taking up much time. As these are limited versions of the game, often featuring just a couple of levels or missions with limited gameplay options, playing them does not take much time leaving the opportunity for specific focused activities to be integrated into the playing experience. And going back to the games mentioned at the start of this response, there are ways to use those within a limited time frame if we have specific goals in mind. 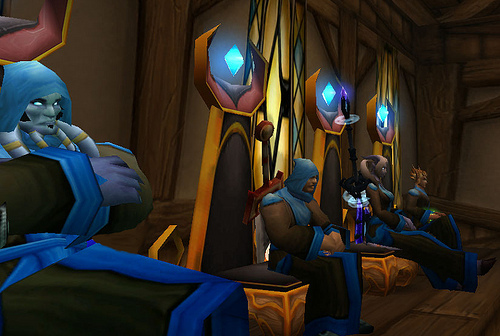 With World of Warcraft for example, learners could be directed to create a new character and complete some set tasks such as an in-game treasure hunt style activity. 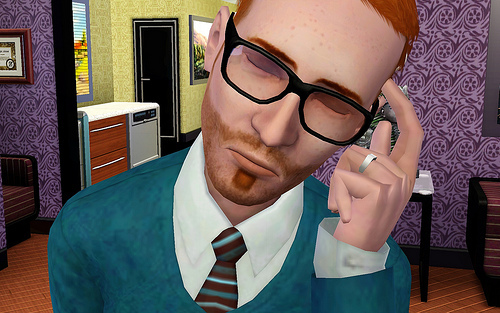 The Sims could also be used for a single lesson activity by simply exploiting the character creation options – ask students to create an avatar representing themselves or a friend in the class and then compare the digital version with the real one; or give them a description of a person and ask them to recreate it in the game (like a digital picture dictation). With a little planning, we can make almost any game part of a productive lesson or series of lessons. What they say: And isn’t it expensive? I’m thinking buying games, providing access for all students, having the necessary hardware for them to play and so on. What I say: Yes, games are not always cheap and the hardware required can be costly. However, there are always ways around such things for resourceful teachers! 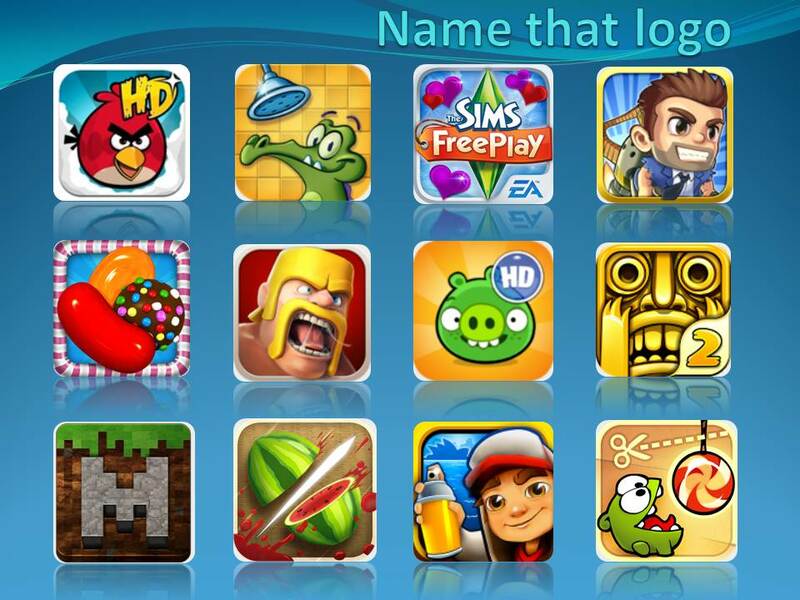 As mentioned above, demos provide a way to gain access to short-term games and these are usually free of charge. An increasing number of online games offer ‘free to play’ options that allow players access to the basic game (one off payments or subscriptions may be required to unlock ‘exclusive content’ but would not be necessary for language learning objectives). This can provide students with a large explorable world in which they can engage in a number of activities. You should, however, be wary of download sizes as many online games (especially MMORPGs) have very large (as in 10GB+ large) download files! Many apps also have demo or free versions (if you don’t mind the adverts), which can easily be downloaded to a handheld device (file size in MBs rather than GBs as well). This can also help us solve any hardware issues. When using PC games, we are often restricted by what is available to us in school but making use of apps allows for a BYOD (Bring Your Own Device) system, meaning students with iPads, Android tablets and smartphones can download an app and access it in class, sharing in groups for a more collaborative experience. Another option is setting GBH. No, not Grievous Bodily Harm but Game-based Homework! 😉 Assign students a task such as recreating a person from a written description to do at home using a game of their choice. They then take a screenshot and email it to you or post it on the class blog – only one computer needed in class for that! And one more ‘myth’ we can forget about – GBL doesn’t always mean we actually have to play games in the lesson or at home. It’s perfectly possible to use the topic of gaming to generate discussion and productivity in the classroom. Ask students to talk about their favourite games, debate what makes a good game and discuss issues related to games – all engaging topics for game-loving learners. What they say: But, not everyone is that interested in playing games. What do we do about those students? What I say: GBL is not for everyone and not every student will respond to it in the same way. Many students will love it and approach tasks with increased motivation but others may not be so enthusiastic. Choice of game can help here. A sports game may be popular with some students but not others just as an app in which you cut models’ hair and apply make-up will not have universal appeal. The two key things are to select games that have a broad appeal (or activities that allow students to make use of a game of their choice, such as creating avatars) and, most crucially of all, to gauge the level of interest your students are likely to have in GBL before introducing it. What they say: So, how and when would you introduce GBL to an EFL class? What I say: I usually start by mentioning a few games in the course of a normal lesson and seeing what reaction I get. I mainly work with young learners (aged 10-13) and they are almost always incredibly keen to talk about their favourite games. 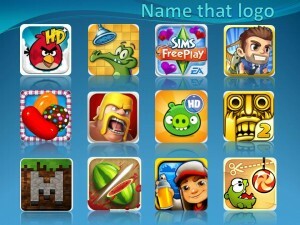 Having received a positive reaction, I then do a first lesson based on games by showing a selection of logos for popular apps (see the image below), asking students to name the games and then describe how to play them (it always amazes me how the language like swipe, tap, drag, touch and so on comes flowing out with no prompting from me) before playing a guessing game in which students describe an app and ask their classmates to guess which one it is. I also ask students to take screenshots of characters they use in their favourite games and share them on the class blog with a short description. This is a great way to appeal to as many students as possible while personalising the activity at the same time. 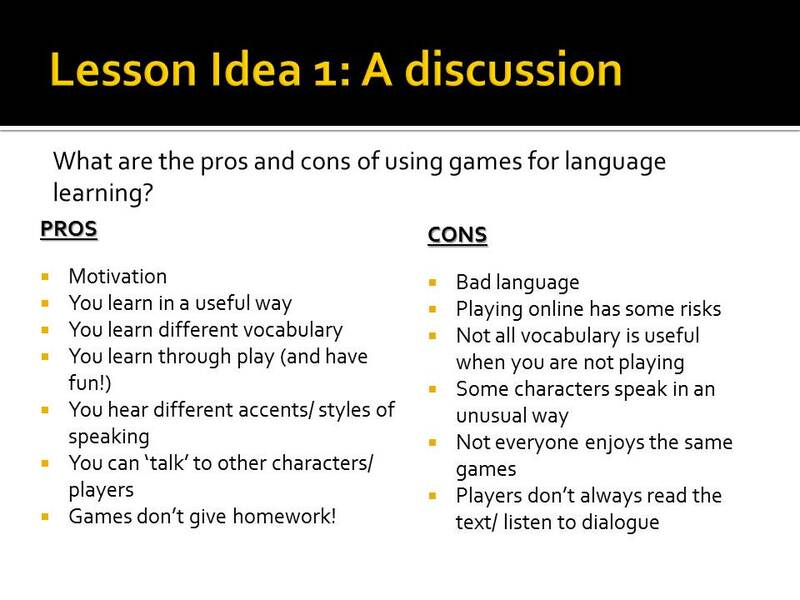 I even get my students to discuss the merits of games for learning languages. 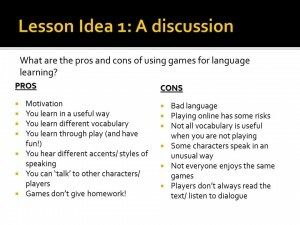 After pointing out that the common thread that binds many games is English, I ask them how games can help us learn and what the pros and cons of using them to improve our language skills are. Rather than describe those to you myself, I shall leave this post with the answers my own students came up with in a recent discussion lesson (remember, they are only eleven!) What do you think? Is there anything else you would add? Dave Dodgson is an EFL teacher working with young learners in Turkey. He has always had an interest in the use of technology to enhance the learning experience and has recently started to look into how computer games can motivate students and promote learning. He is the blogger behind ELT Sandbox (eltsandbox.weebly.com) and also tweets about gaming in ELT(@eltsandbox) as well as running a Facebook page on the subject (facebook.com/eltsandbox1). He also runs a ‘regular’ teaching blog (davedodgson.com). Photo Credit: unloveablesteve via Compfight cc. Text added by eltjam. First, thank you for your excellent post. 1. If you made a list of the games that were valuable for language learning (as opposed to ones that students just wanted to play) what percentage would you guess are inherently non-violent? 2. Do you think it is appropriate for us as teachers to be recommending students play games that involve some kind of violent action or reaction. Especially games in which kids are steered into violent activities and then directly REWARDED for the violence by game mechanics? 3. Do you think that we as teachers should raise our voices in favor of non-violent games that reward students for behaviors that we deem as being socially responsible or morally acceptable? BTW I am aware of the research that suggests that violent games do not turn people to violence. I believe however that violent games, often playing on very base emotions, have evolved to such a degree that kids can and do get hooked. Is it possible that too much of a good thing (fun) is just too much? Should we be cautious when students are having fun in the midst of a game? Before responding, I guess I should define what I see as ‘violent’ in computer games and other visual media. Obviously, the likes of Grand Theft Auto, Call of Duty and Assassins’ Creed contain high levels of violence and the player, controlling the main character(s), must actively engage in it and I do not see such games as suitable for playing in class. However, many games aimed at kids could also be seen as violent (such as Super Mario kicking Goombas down holes or jumping on their heads or Angry Birds smashing into green piggies) in the same way that Tom and Jerry could be seen as violent. I don’t mind such games as the action is usually cartoon-style and/or there is a clear distinciton between the ‘Good guys’ and the ‘Bad guys’. 1) Almost any game can be adapted for language learning but of the ones I have used in recent times (Universe Sandbox, Can You Escape? The Sims, Cut the Rope, Star Wars: The Old Republic), I wouldn’t class any as violent. Star Wars does include missions to eliminate enemies but that is part of the film’s legacy and there is also an interesting appeal in the game that your actions and decisions result in you going to the light side or the dark side, which could be ecploited for critical thinking skills. 🙂 The Sims also has a grey area in the character interaction option called ‘making whoopee’ which is best avoided in class! 2. Again, going by my understanding of violent as stated above, I would not encourage my students to play such games and I have repeatedly tried to dissuade them from playing such games. I had one incident last year in which a boy kept trying to talk to me in breaktimes about a game ‘Dead Space 3’ which is an alien horror game and in no way suitable for an 11 year-old. In the end, I told him I didn’t want to talk to him about games any more and suggested to his parents that they should keep a closer eye on his gaming. I think it is necessary to address these issues as part of our responsibility as teachers. 3. Following on from the above sentiment, yes, I do try to guide my students towards more ‘suitable’ games. I know several students of mine purchased Universe Sandbox, a space simulator, after we had looked at it in class and many more downloaded Can You Escape? as a result of activities we did with it. Quite often, they are just drawn in by the big names and best sellers (which are often games intended for adult audiences) and need someone to show them some other options and hidden gems. After all your comments, all I can say from afar is that your students are lucky (even blessed) to have you as their teacher. GBL & BYOD are current trends and the more practical info we teachers can get the better. I’m a tech savvy teacher when it comes to apps for classroom use & self study but I had not realised the great learning environment that games can be. Your article has encouraged me to try a new resource. Is the general idea that the kids play a game in pairs and are encouraged to talk through possible solutions together? I have thought about doing this with games like Cut the Rope or Amazing Alex , which require the players to think through possible scenarios (definitely not twitch-mechanic action games, which wouldn’t allow simultaneous reflective talking time). Do you have any specific step-by-step approaches that work well? I’ve also recently discovered cooperative games such as Forbidden Island, which involves collaborative decision-making of a team (2-4 players) against the ipad. This is also a card game but the ipad version is cheap and good for mirroring on a screen. Hi Oliver and thanks for the comment. Cooperative play is one way to go – getting the students to discuss strategies, offer each other advice and suggestions, and engage in a post-game discussion certainly gets lots of language flowing (though you have to be careful in a monolingual class that thay don’t slip into L1). I like the ideas you have suggested. I have used the Cut The Rope cartoons (search Om Nom Stories on YouTube) to create a game-based but non-game-playing lesson that really got my young learners engaged so it’s not only about cooperative play. I have also had my students look at walkthough texts and videos online to get help for a difficult part of a game and we also look at game reviews from time to time. I agree! GBL is a great way of getting students involved. Maybe some are passive but its okay. I suggest to start the class do it as a group where the shy ones are not the main player. Then eventually, these students will be challenged and know that they can do it, too. In this time where technology is everywhere and is a vital part of our lives, teachers must grow and be familiar with what the younger generations are familiar with. Structuring lessons using GBL in attaining learning objectives I think is best. But teachers must consider what, when, how long, how often, why GBL will be used .